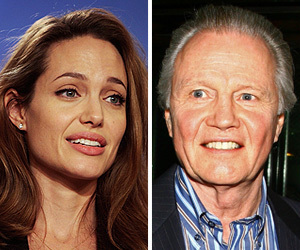 Have Angelina Jolie and Jon Voight Reunited? Are Angelina Jolie and her estranged father Jon Voight reuniting after years of bitter feuding? Jon was spotted leaving New York’s swanky Waldorf Astoria hotel with a huge smile on his face – and it’s the same hotel where Angelina is staying with her family! But "Extra" has learned that Jon was not there to see Angie -- he was at the hotel to see his goddaughter. Jon has reportedly never met Angelina's children. She broke off ties with her father after he publicly said she had “mental problems” following her split from Billy Bob Thorton in 2002.